In order for virtual reality to truly hit off it will need to become essential to us, much like excel spreadsheets became for computers and smartphones became for day to day life. The experience of virtual reality has to be so good that you would put the headset on. Once it gets established as a habit, it’s a device that could truly become mainstream. However, creating this new habit in people will be the real challenge, not developing the actual technology. The virtual reality industry has recently hit a cool period which makes it an ideal time to invest in its stocks. The question has never been if it will boom, it’s rather a question of when. It is a technology that can take many industries to a whole new level and it would not be farfetched to imagine that in ten years VR is something we will be using on a regular basis. The big impact this technology would have on our lives will probably not be seen in the next year or two. But that does not mean we should underestimate the popularity of it that could come in ten years’ time. In the coming decade, VR may very possibly be the next biggest stepping stone in technological innovation. It is an innovation that has a lot of long term potential. Although it might not be profitable to invest in it in the short run, its long term prospect is too promising to ignore. 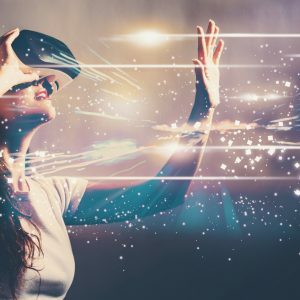 VR has the capability to transform so many sectors and as such it opens up for prosperous opportunities for the brave trendsetters in the investment industry. It is wise, as always in investment, to be careful with what technological revolutions you invest in. New technology comes with the risk of becoming a complete flop if the consumer market isn’t ready to adopt it. VR however, is thought to become as big a revolution as the recent app revolution. As such, virtual reality stocks are believed to take off in the foreseeable future. Different headsets of virtual reality have been emerging, but none has reached the mainstream consumer. This is because the companies developing it were building for a consumer that simply wasn’t quite there yet. Developers need to find a way of making it the new iPhone, so that despite the cost, it becomes a must-have to own and something that will reach a large market. It is worth for the naysayers to remember that even when film first came about, everyone thought it was going to be a disaster. The idea that moving pictures would attract audiences was ludicrous and it something expected to disappear within the decade. Just look at it now, being established as one of the biggest industries in the world. VR might not have been able to produce anything that has pulled in the masses just yet, but it is well on the right path. With a ton of industries able to benefit from its use, it is destined to become one of the top sought after items in technology.